There are two parts in a cyclotron application: A pure data-flow, and side effects. The pure data-flow is composed of pure functions. Pure functions are functions whose behavior is deterministic. This means that their output depends only on their input parameters. The pure data-flow part is where the application logic is implemented. A side effect is any function that is not a pure function. For example a function that take no parameter as input and returns the current date is a side effect. Also any function that work on IO is a side effect because its result depends the underlying IO. The pure data flow and the side effects communicate together via Observables. 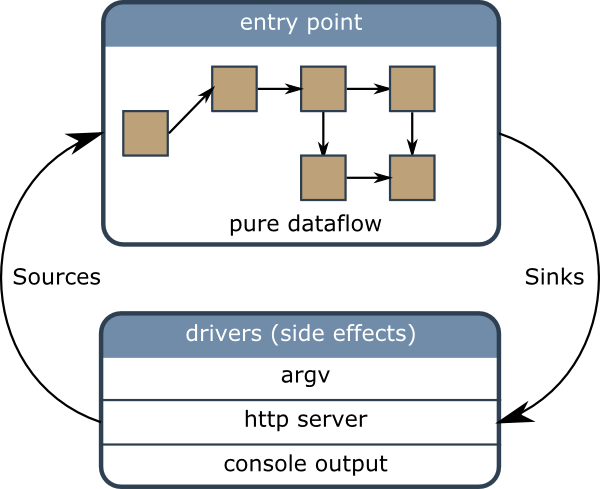 By convention, the output Observables of the pure data flow (that is also the input of side effects) are called sinks. The input Observables subscribed by the pure data-flow (being also the output of the side effects) are called sources. Note how the pure data-flow and the side effects form a directed cyclic graph: They depend on each other. Managing such Observable cycles is not always easy. Cyclotron handles naturally such cycles between the pure data-flow and the side effects: A bootstrap function connects circularly the pure entry point with the side effects. A reactivity diagram uses the representation of UML activity diagrams, but with a different meaning. An activity diagram represents a code flow, and each link represents a call to a function or a method. A reactivity diagram represents a data-flow, and each link represents an Observable. So each action being described is called for each items emitted by the Observable. On this example, the http server is a side effect, represented with a rectangle with the upper-right corner bent. Operators or actions are represented as rounded rectangles. 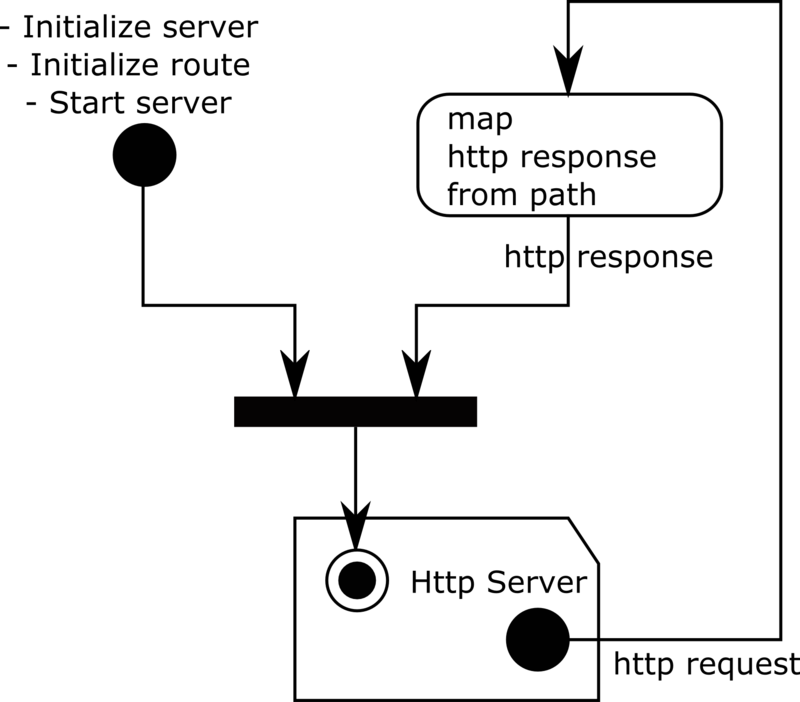 In this example each request received from the http server is mapped to a response. The thick horizontal line represents a merge operator. Note that this very simple example already contains an Observable cycle. No let's see the implementation. Their fields can be accessed directly from their names. So this syntax is less verbose than using dicts: A foo field is accessed as a.foo instead of a['foo']. Namedtuples - like tuples - are immutable. Immutability is one foundation of functional programming. The idea here is to embrace immutability via namedtuple as much as possible. Then several Cyclotron imports are used, as well as the Observable definition from RxPY. Since this application is very simple, there is a single source, a single sink, and a single driver being used. The http driver needs both a source and a sink. Some drivers may be source only (they only emit items), and some drivers may be sink only (they only consume items). The echo Observable is the handler of the echo route. It listens to the source of the http server and subscribes to the Observable of the echo route. Then, for each item received on this Observable, a response is created, based on the request's path. After that the init and echo Observables are merged so that they can be provided as a sink to the http driver. The whole code is available on the GitHub repository of cyclotron-aio. They are available from pypi. The sources and links to documentation is available on GitHub.